MARCH 2017 PREVIEW: Sun motorcycles were manufactured from 1911 until 1961, but their roots go back to the Victorian Birmingham brass foundry of James Parkes & Son. We delved into our archive to show some of the motorcycles, autocycles and scooters that proudly carried the Sun name. 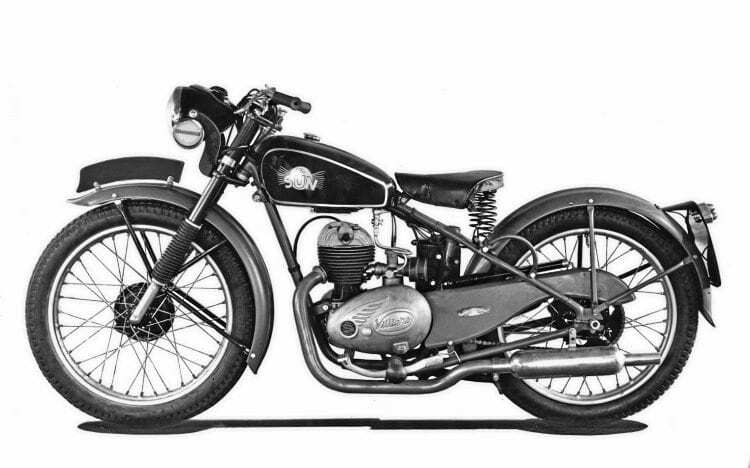 Published in Motor Cycling in March 1953, this photo of a 197cc Villiers-powered Sun Challenger was used in a feature entitled ‘Modern British Motorcycles’. With telescopic front forks, single sprung saddle and rigid rear end, it was a typical affordable lightweight of its day. The ‘Sun’ brand name, which first appeared in 1885, was inspired by the incandescent lamps produced by the Parkes family’s original brass foundry. Like many other famous motorcycle manufacturers, the first diversification into two wheels was in bicycle manufacture, and arguably the bicycles, which began with the Sun Spider penny-farthing, became even more well known than their motorised counterparts. In 1907, James Parkes’ son Joseph changed the firm’s name to The Sun Cycle and Fittings Company Limited of Aston Brook Street, Birmingham, a title that remained until virtually the end of motorcycle production, when Raleigh Industries acquired the Sun brand. Sun’s first motorcycle, the Sun Precision of 1911, was powered by a 3½hp Precision engine, but in the following years engines of JAP, Blackburne and Villiers manufacture were also used.